Manchurian Lilac (aka Korean Lilac) is a medium-sized shrub that features fragrant clusters of pale purple flowers in late spring. 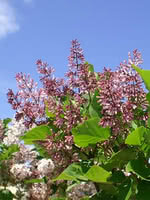 Manchurian Lilac is less affected by disease than other lilacs and will create a beautiful border, hedge, or privacy screen. 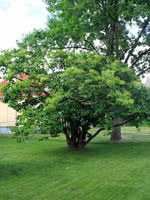 If you are looking for a lilac for your shelterbelt, consider Common Purple Lilac or Villosa Lilac first. 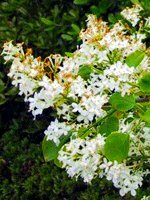 Select Cultivar: Miss Kim Korean Lilac is an ornamental, late blooming shrub that reaches 7ft tall. Its compact form makes it a great contender for small yards, especially if you are creating a border accent or privacy screen.